Happy Derby Day, ya'll! I hope you've had a good one and maybe even won a little cash if you tried your luck at the races. My sister won a TON of money at Keenland for picking the trifecta. She sent me a picture of the payout ticket, but I think it might be illegal to post that kind of thins. Anyway, I don't have that much luck myself, but I did have a good day nonetheless. Last night was Family Movie Night. We watched The Sandlot and in an amazing turn of events, everyone fell asleep super early, which put us all in a good mood today. Our first stop was the ball field. 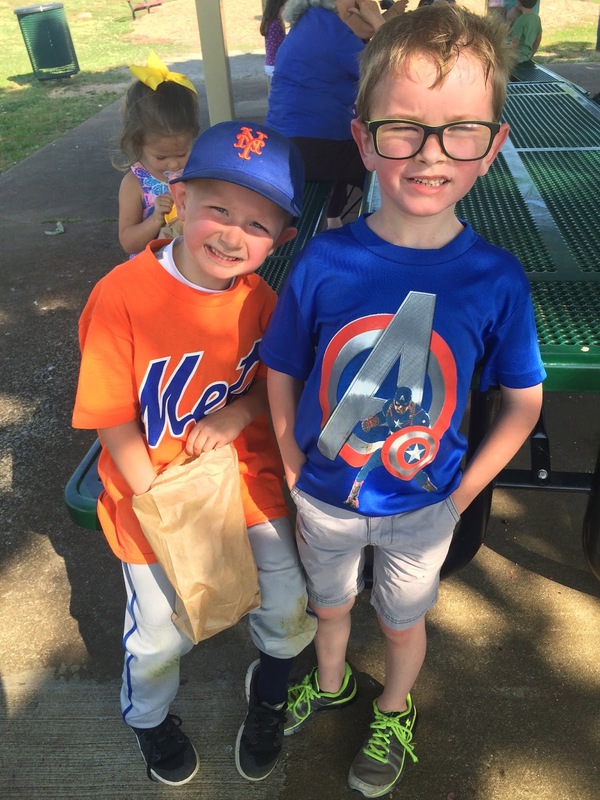 My little bleacher buddy helped me cheer on her brother in good game of baseball! After the game, we went to a party for the Adkins twins. These two had the best time playing together. We have to reunited them more often. It's so good for their souls and mine too. They are just the best family! After the party, we ran by the grocery store where the kids were actually super well-behaved! Can I get a fist bump from the momma's out there?!?! We made it home just in time for the Run for the Roses. Eli was so excited and proudly sang "My Old Kentucky Home," which brings me to tears every stinking time. Ha! Anyway, he wanted his horse and a Nascar helmet so he could participate. Apparently, the Watson's do not believe in specter sports. We rounded out the evening with burgers for dinner and another early bedtime! Oh, Eric also go our pool open for the summer…what an awesome day!